As the Top of the World Turns: Eww! 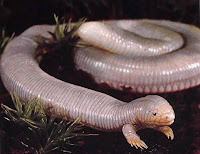 This fellow is an ajolote, or worm lizard. It's not a snake, but a case of parallel evolution. Various species are found in Africa, Mexico and South America. Only the Mexican ones have forelimbs. The Swiss have a cryptid called a Tatzelwurm that seems similar, but it's supposed to have a catlike head.